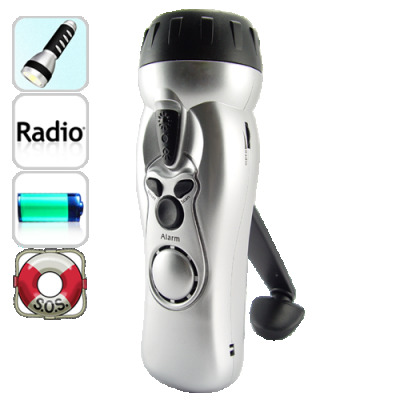 Successfully Added Wind-Up LED Flashlight with Cell Phone Charger, Alarm and Radio to your Shopping Cart. Every household, camper, traveler, vehicle should have one of these Wind-Up LED Flashlights with Cell Phone Charger, Alarm and Radio. It’s a must have first aid kit for emergency events. Compact and reliable, this gadget is the easiest and quickest way to generate power needed. Just wind the handle for a few minutes and it will have enough power for the flashlight for hours, which in emergent situations could be the only light in darkness for you. You will never have to worry about batteries. With a few simple wind-ups to give it a power boost, you will be able to charge your mobile phone. Listen to your favorite FM radio channel, or use the loud siren alarm if you are lost or need help, this handy gadget can do more for you. An effective and versatile four-in-one tool which also makes a great outdoors gear, this product is now available for immediate shipment at an incredible wholesale price. Order today and it gets shipped within a day. Brought to you by your source for direct from factory electronics, Chinavasion. Can I use it when there’s an earthquake, a tornado, nuclear radiation, fire, or flood? Absolutely. You can even use it to provide some badly needed power for making emergency calls if you are kidnapped by invading aliens. This flashlight and phone charger does not require any external power. It’s small but sturdily built. This is a must have first aid tool for everyone. on 2011-09-30 08:00:02 HOW CAN we order won't accept our address? We cannot check out our order on your system as it does not recognize our address. Are you sending from the USA? and how do we place our order? How much is the shipping for 40 pcs? This is our address: support@chinavasion.com. Thanks again. on 2011-09-30 07:59:15 We like this product! We like this product very well as it seems to be made well, operate well and do what it says!